In Natural Arch at Capri, William Stanley Haseltine offers a composite view of well-known rock formations and vistas from the Italian island. In addition to the Arco Naturale at the center, sheer, rocky crags rise abruptly from the sea on the right. These are the Faraglioni, which would not, in reality be visible from this vantage point. Atop the farthest cliff on the left are the gleaming white ruins of Villa Jovis, one of 12 villas built on Capri by Emperor Tiberius in the first century. Although Haseltine gave the image a striking sense of geological accuracy, he was not bound to strict topographical fidelity, instead demonstrating a strong interest in capturing the general spirit of Caprese scenery in a single balanced and harmonious composition. Haseltine combines these seemingly-opposed modes of landscape painting to a powerfully dramatic effect. By juxtaposing a close-up, detailed foreground with a distant, atmospheric background, Haseltine created a dynamic spatial tension that moves the viewer's eye from near to far and back again in a visually startling way. He deliberately minimized the presence of human elements: only the miniscule sailboats plying the water and the tiny form of the Villa Jovis give the viewer any sense of relative scale. As a result, the foreground rocks seem fantastically huge, capable of dwarfing all human endeavor. This theme of man and his creations appearing insignificant in the face of nature was common in nineteenth-century American landscape painting. 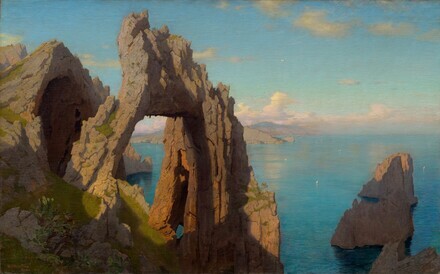 Haseltine had long been fascinated with coastal scenes in which unusual and dramatic rock formations stood in stark juxtaposition to the sea. In the late 1850s he had made such landscapes in Italy before returning to New England in the early and mid-1860s. In these "rock-portraits," as one contemporary described them, Haseltine focused on three main elements—massive rocks, expansive sea, and radiant sky. It was through similar means that the artist portrayed the famous coastal sites along the Bay of Naples when he returned to Italy in the late 1860s. But by the time this painting was completed in 1871, Haseltine's style had evolved beyond pure topographical transcription to capture dramatic scenes of natural beauty that helped elevate the status of landscape painting in the decades following the Civil War. lower left: WSHaseltine / Rome.1871. (sale, Ader Picard Tajan, Paris, 27 April 1987, no. 145); Jody Klotz, New York; (Berry-Hill Galleries, New York), by 1987; purchased 24 February 1989 by NGA. Art for the Nation: Gifts in Honor of the 50th Anniversary of the National Gallery of Art, National Gallery of Art, Washington, D.C., 1991, 164-165, color repro. Expressions of Place: The Art of William Stanley Haseltine, The M.H. de Young Memorial Museum, San Francisco; Brandywine River Museum, Chadds Ford, Pennsylvania, 1992-1993, no. 43, 42-43, repro. 118. Pompeii and the Roman Villa: Art and Culture around the Bay of Naples, National Gallery of Art, Washington, D.C.; Los Angeles County Museum of Art, 2008-2009, not in cat. (shown only in Washington). The support is a medium-weight, twill fabric that remains unlined. It is mounted on the original five-member, mortise-and-tenon stretcher with tacks that were hammered in halfway and then bent over (see Marina Piccola, Capri [1953.10.1]). The fabric was primed before stretching with a thin, off-white ground. This ground layer is exposed in areas where the sky meets the rocks, and it plays an important role in the overall effect of the painting. The paint was applied relatively thinly, but with significant areas of texture, impasto, and active brushwork, especially in the rock formations. Losses and abrasion are minimal and the painting is generally in very good condition. In 1990 discolored varnish was removed and the painting was restored. American Paintings: An Illustrated Catalogue. National Gallery of Art, Washington, 1992: 195, repro. Simpson, Marc, Andrea Henderson, and Sally Mills. Expressions of Place: The Art of William Stanley Haseltine. Exh. cat. M. H. de Young Memorial Museum; Brandywine River Museum, Chadds Ford, Pennsylvania. San Francisco, 1992: 42-43, 118, no. 43. Simpson, Marc. "The Early Coastal Landscapes of William Stanley Haseltine." Antiques (August 1992): 211, color repro. 212-213. Kelly, Franklin, with Nicolai Cikovsky, Jr., Deborah Chotner, and John Davis. American Paintings of the Nineteenth Century, Part I. The Collections of the National Gallery of Art Systematic Catalogue. Washington, D.C., 1996: 274-278, color repro.